Determining the Stabilometer Value for Asphalt Concrete is a testing requirement of California Test Method (CTM) 366. The purpose of the test is to determine the resistance of the asphalt to lateral movement. The cylindrical sample is heated to 60° Celsius, placed in a Hveem Stabilometer device, and then compressed axially. The stabilometer measures the horizontal pressure that is produced while the specimen is under compression. The test procedure requires loading the sample in compression while inside the stabilometer. 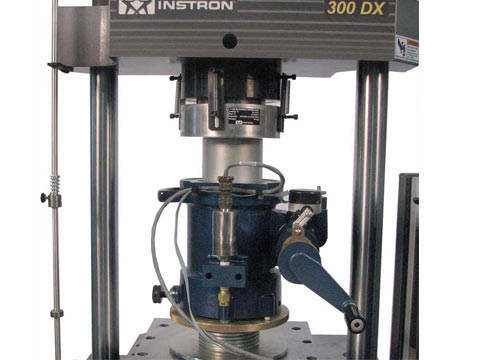 The compression tester must allow for the entire stabilometer device and following ram to fit inside the compression test space. The test often requires two operators to accurately record horizontal pressure readings from the gauge on the stabilometer at compressive loads of 2.22 kN, 4.45 kN, 8.9 kN, 13.3 kN, 17.8 kN, 22.2 kN, and 26.7 kN. Additionally, one of the technicians must turn a pump handle that moves a displacement turns gauge on the stabilometer, and this value is also recorded for use in the calculation. For this test, we used a 300DX Model Compression-only test machine with Partner™ testing software. The Partner Gentest application allowed for proper test control. The software prompts the operator to take Stabilometer readings, eliminating the need for a second operator. The Stabilometer Value was calculated automatically from the variables input by the user and by the load values recorded by Partner software. The large test space and special table extension allowed the stabilometer to move easily in and out of the test space. The spherically seated compression plate included a locking ring so it could be used in a fixed state during other operations including applying leveling loads.